Project Manager Jimmy Parker, vice president of Precision Planning Inc. of Lawrenceville, suggested the Management Board should consider two possible sites for recreational facilities, built around boat ramps. The first is off exiting Social Circle Fairplay Road near its intersection with Mt. Paron Church Road. The site is between the two main branches of the reservoir. 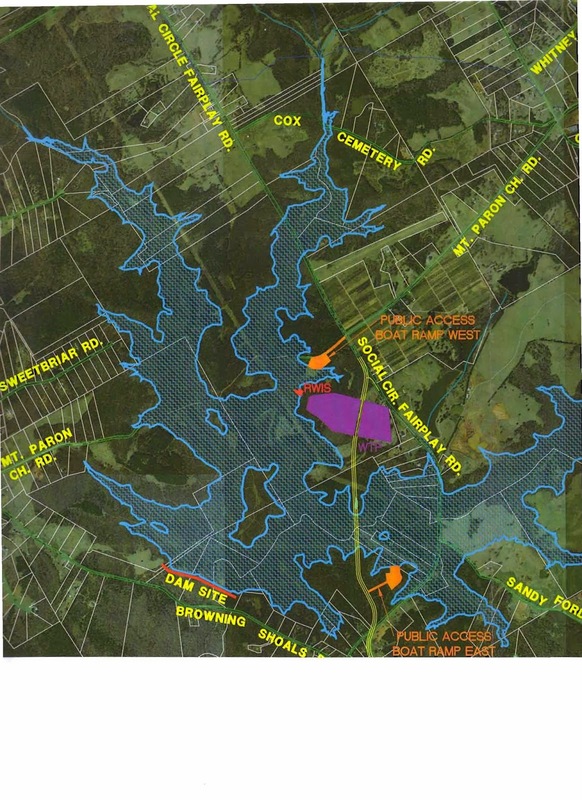 The second is off the relocated Social Circle Fairplay Road closer to and north of the dam site. Parker told the Management Board that he felt it should plan for recreational use of the facility before the lake is filled, probably sometime in 2017 or 2018, depending on rainfall. The dam itself is scheduled to be completed in January of 2015. By constructing the facilities before the lake is filled, Parker said, the Management Board would hold down costs because construction would not be affected by lake water. Parker said he recommends two sites because of the size of the reservoir. Since the reservoir is being built for drinking water, Georgia Environmental Protection Division regulations prohibit the use of gas-powered motors, Parker told me in an email message following the meeting. Parker told the Management Board that it had spent only $2,390 on the Oct. 4 groundbreaking ceremony at the construction site. He said between 210 and 220 people had attended the event, including Gov. Nathan Deal, around whose schedule the event had been organized. Parker said costs were low because Shane Short, executive director of the Development Authority of Walton County, donated his services for event planning and the Walton County Public Works Department had done site preparation work but not billed the Management Board. Parker said the expenditures were under a budgeted amount of $2,500, but no such budget was set in the last public meeting of the Management Board, when the idea of the groundbreaking was first discussed. “I thought it went very well,” Kevin Little, Walton County Commission chairman and vice-chairman of the Management Board, said at the meeting held on Nov. 19 at the Walton County government building in Monroe. Chairman Little volunteered to serve on the Hard Labor Creek Regional Reservoir Recreation Committee. He was joined by Chris Thomas, Oconee County Utility Department director, and Rob Kiser, Walton County Water and Sewer Authority chairman. Thomas is an alternate to the Management Board representing Oconee County. Kiser is a member. The reservoir is a joint project of Walton and Oconee counties, and Walton County has four members on the Management Board and Oconee County has three. The reservoir will have a shore line of 42 miles and a pool of 1,367 acres when it is completed. The video below, lasting just more than eight minutes, includes the discussion of the recreational committee and of the groundbreaking. Parker is seated to the left at the head of the table, and Little is to the right. OCO: Hard Labor Creek Reservoir Recreation from Lee Becker on Vimeo.